Marketing Assistant Cat designed a beautiful selection of free papers, great for adorning your Easter and springtime makes. These papers proved to be very popular among you crafters so if you didn't get your free download, make sure you get your floral, polka and bunny filled papers to use for your pretty Spring projects! We next had an adorable tutorial on how to craft a gift bag filled with yummy chocolate eggs for Easter! This template is perfect for a range of occasions, so why not print your own template and add your own personal touch to it! (Though we think the bunny topper is a keeper in this craft!). The Trimcraft team just couldn't get enough of bunnies this month and for card shape of the month, Craft Coordinator Maxine taught us how to make a double gate fold bunny card. It may sound complicated but with our free template, it couldn't be easier. With the beautiful addition of the Pretty Posy papers, this craft would be fantastic for a bunny lover in your life. Adult colouring is very much in trend in the crafting world and Maxine thought of a clever way to use just one wooden Dovecraft stamp to create your own colouring paper. Choose a favourite design and soon you'll be on your way to making a snazzy colouring paper layout. Everyone loves the opportunity to use a new collection and design member Katie passed on some crafty wisdom on how to use the gorgeous Floral Muse designs to embellish your scrapbook layouts. With a floral and foil touch, your layout will be ready to fill with your favourite memories! We love the 1 die 3 ways tutorial by Maxine and can you guess what die we used? Yes it was bunny related! This month we used the First Edition Animal die set to make three lovely projects. 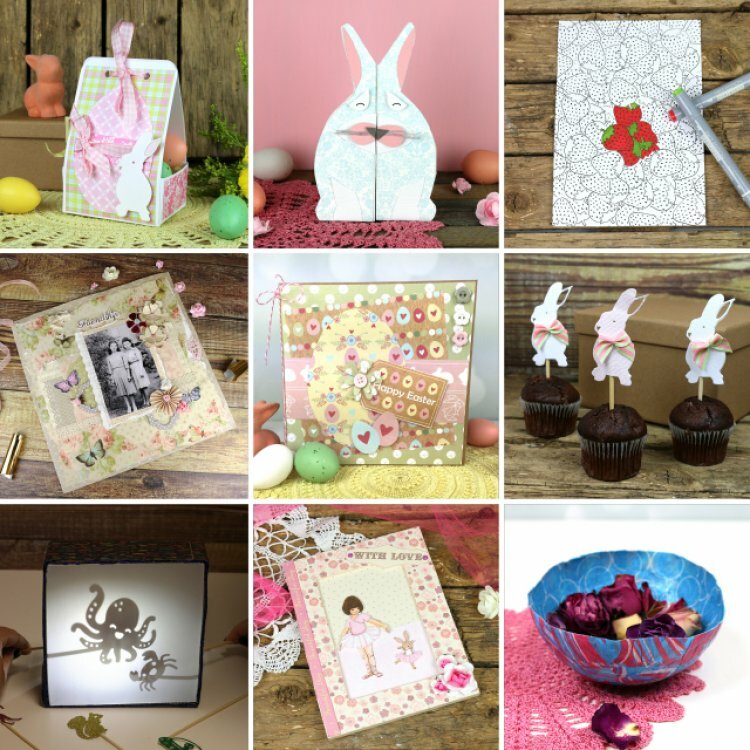 From cake toppers, bookmarks to cardmaking, you'll certainly be busy with bunnies! Let your kids' imaginations go wild with our DIY shadow box tutorial! Make your First Edition die characters come to life with the help of a flash light, (we particularly liked playing with the UFO die!) We think bed time will be a blast with this project! The newest Belle and Boo collection has been released and we can’t get enough of the beautiful designs! On the blog, we show you how to embellish a frame using the crafty decoupage set and embellishments, it’s just so pretty! Follow our easy tutorial on how to craft a DIY bowl to use around your home using the gorgeous Simply Creative Decoupage papers, you will definitely be set for any party coming your way. We can't wait to show you what we have in store for April! Get ready to fill your home with easy to follow DIY projects! Remember to keep uploading your brilliant crafts to the project gallery and to #Trimcraft when uploading on social media!